Office 365 import tool is very safe for converting MBOX files consisting of variety of data items like messages, contacts, calender etc. Moreover it migrates emails along with attachments which can be either document file or media file. 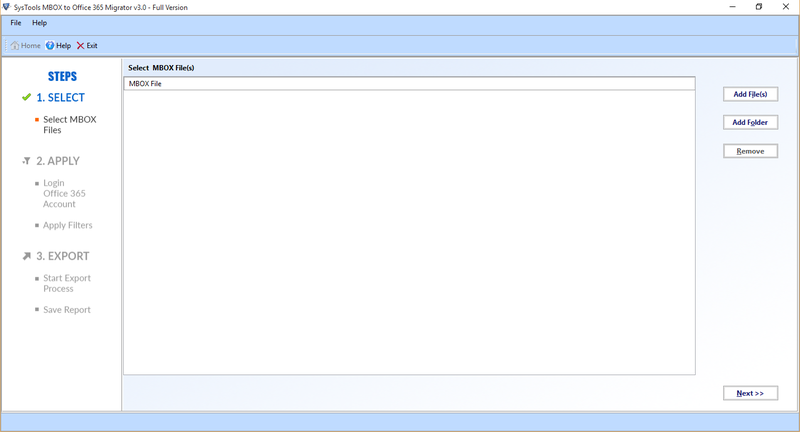 MBOX to Office 365 tool facilitated the user with two options to import MBOX files. The first option is to add MBOX one by one into the software. The other option is too add a folder (consisting of multiple MBOX files) to import multiple MBOX files all at once to Office 365. The software has the ability to import corrupted MBOX files to Office 365 account. A user having damaged file can easily move them into O365 user account without any issue. Moreover, the deleted data items like Inbox.mbox, trash.mbox, sent items.mbox , etc can also be converted without any trouble. This software provides date range filter option so that user can set the date interval within which they want to import MBOX mails to O365. This tool will convert only those mails which occurs within date range settings. In “From” and “To” options, user need to specify the range for exporting specific mails. 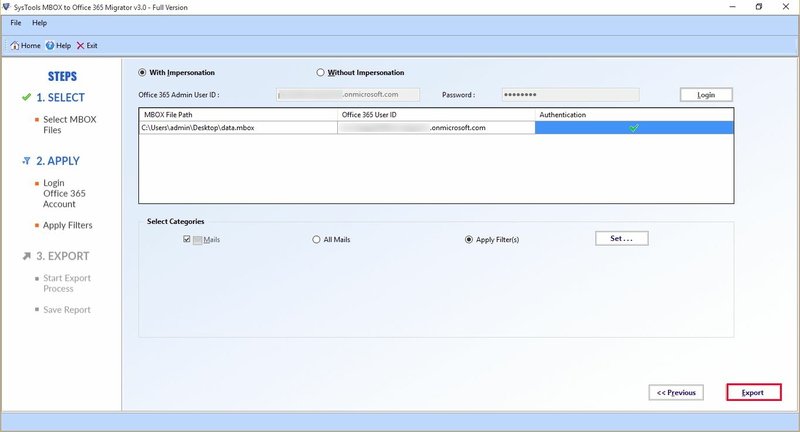 MBOX to Office 365 tool provides the of exporting MBOX files with impersonation facility. 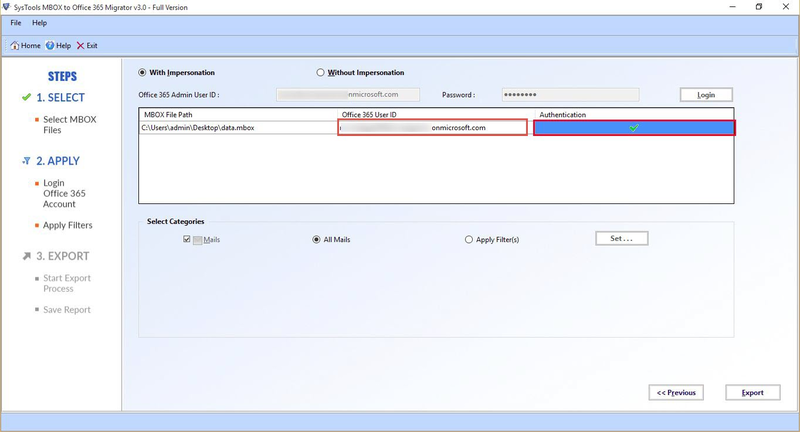 This feature is specifically available for admin users, where the admin have to provide ID and Password for importing. Otherwise, for each MBOX file, a user have to provide credentials of O365 account each time for exporting files. This feature of tool helps users to access their MBOX data easily in the same hierarchy of folder in which it was before the conversion of MBOX. The nested structure of folder will remain same when users access the imported data in their Office 365 account. When users export MBOX file to Office 365 account, the processing status of data can be seen and after the completion of migration process, this tool generates a report with all details of conversion in a CSV file format. Why users migrating towards Office 365 platform? MS Office 365 provides one of the best platform for business users to access all the Microsoft applications like Word, Powerpoint, Excel, Outlook, One Drive etc. Office 365 users are able to access these and many more applications online using internet connectivity from any place. Since it is a cloud based service so there is no maintenance cost. This is the major reason because of which users are migrating towards Office 365. What is the need to import MBOX to Office 365? A we all know MBOX files are diversely used file format by web based and desktop based mail application for storing mails. Some of such applications are Mozilla Thunderbird, Entourage, Eudora, Opera Mail, SeaMonkey, Google Takeout, Webmail backup files etc. Any MBOX can be used by other MBOX supported email clients but there may be users need to upload MBOX to Office 365 account which can be possible by only a suitable and efficient import tool. Step 1: Download, Install and Launch Import MBOX file to Office 365 utility. Step 2: Browse the MBOX file on your local machine and click on Next. Step 3: Provide the credential of Office 365 account for importing MBOX file. Step 4: Hit the Export button to start adding MBOX files to Office 365. This video explains how to import multiple MBOX files to Office 365 account and also explains all other features of this software. Know step by step method to upload MBOX File to Office 365. Can I import multiple MBOX files to Office 365 at a time using this tool? Yes, you can browse a folder containing multiple MBOX files and all these files can be imported simultaneously. Can i import a corrupted MBOX file to Office 365? Yes, this utility also upload the corrupted or damaged MBOX file to Office 365 account. Does this tool supports Mac OS? No, this tool can be used to import MBOX file to Office 365 only on Windows OS. How can I use the impersonation option provided in the software? Impersonation option is available for admin user only. It allows an admin to move multiple MBOX mailboxes at the same time. You just need to provide your ID and Password only one time to complete the procedure. Otherwise, the user has to mentioned ID and Password for each and every mailbox. Can you please list some feature that I will be provided with on its purchase? In my organisation we all were using Mozilla Thunderbird as an email application but recently company decided to move on cloud. 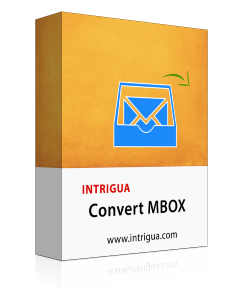 Intrigua MBOX to Office 365 tool helped us lot to import MBOX to Office 365. Actually my .mbox files get corrupted and some of its emails get deleted and size of MBOX files is very large. 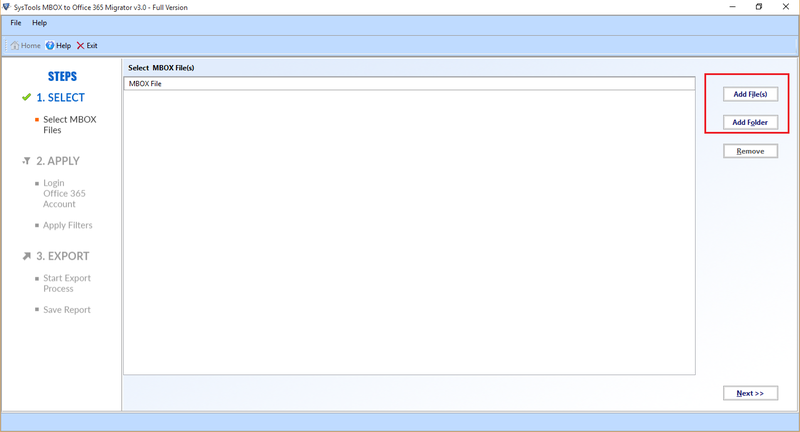 Then I decided to switch on cloud, I found a great tool which easily moved my damaged MBOX file to MS Office 365. Thanks to the development team of MBOX to O365 converter.